Senior police officer Nixon Agasirwe and several others are facing trial over misconduct. The General Court Martial on Tuesday cancelled bail of three police officers who are accused of kidnapping a former bodyguard to Rwanda President Paul Kagame in 2013. 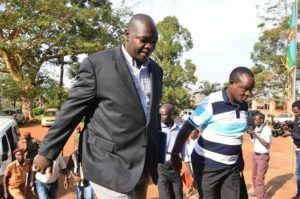 Fisal Katende, Kwarisima Amon and James Magada, who are accused alongside nine others, including senior police officers Joel Aguma and Nixon Agasirwe, were sent back to Makindye Military Police Barracks by the court chairman, Lt Gen Andrew Gutti, who accused their lawyer of disrespecting the army court. Trouble started after their defence lawyer, Mr Caleb Alaka, informed the court that his clients will not submit to its jurisdiction as they are not military officers. Mr Alaka was waving a copy of a High Court ruling, which recently ordered the immediate release of the officers from custody on grounds that the military court acted unreasonably to charge them with offenses of being in unlawful possession of firearms yet they use guns in the execution of their duties. He then asked the military court to immediately discharge the officers, including Agasirwe, Aguma, Atwebembeirwe and Tumukunde, adding that the latter cannot plead to fresh charges of being in unlawful possession of grenades yet the High Court quashed the trial. In response, Gen Gutti informed Mr Alaka that there is harmony in this country and that the UPDF will continue respecting the law, before ordering that all the seven police officers be remanded to Makindye Police Military barracks and their civilian to Kigo Prison until March 27. The accused had returned to the military for the mention of their case. Katende, Kwarisima and Magada had been granted bail in January on grounds that they are junior officers who could not interfere with CMI investigations or threaten witnesses. Other suspects are Rwandan national Rene Rutagungira and Bahati Mugenga Pacifique also known as Ilungu Monga, a Congolese national. All the suspects have since pleaded not guilty. The state alleges that on October 25 2013, at Kamengo in Mpigi District on Masaka Road, Aguma, Agasirwe Karuhanga, Magada, Atwebembeire, Tumukunde, Katende, Kwarisima, Rutangungira and Mugenga while in unlawful possession of firearms and grenades ordinarily a monopoly of the defence forces conveyed a one Joel Mutabaazi without his consent to the Republic of Rwanda.